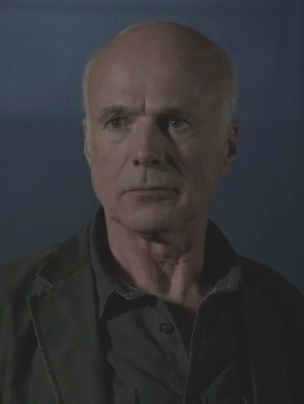 Gerard Argent is Chris Argent and Kate Argent's father, Allison Argent's grandfather and a member of the Argents' hunter clan. 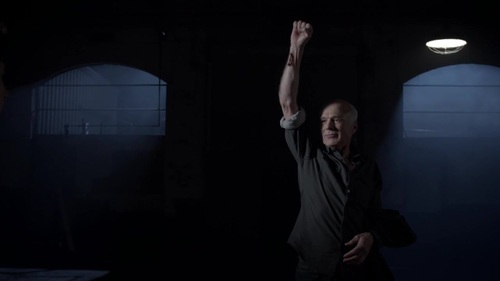 Prior to the series, Gerard answered to the alpha Deucalion's peace proposal, but betrays and kills his fellow hunters, then frames and blinds Deucalion. He contracts cancer and sought to obtain the bite from an alpha in order to survive. 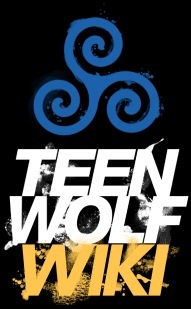 In Season 2, Gerard arrives in Beacon Hills, California, murders an omega werewolf to declare war on the werewolf population of Beacon Hills, forsaking the code in revenge for Kate's death to carry out his plan. He spear-heads the hunt for Derek's pack, then blackmails Scott McCall into being his spy. Gerard orders that Victoria Argent commit suicide to prevent herself becoming a werewolf, then manipulates Allison into becoming a ruthless hunter and finally becomes master, of a kanima Jackson Whittemore. 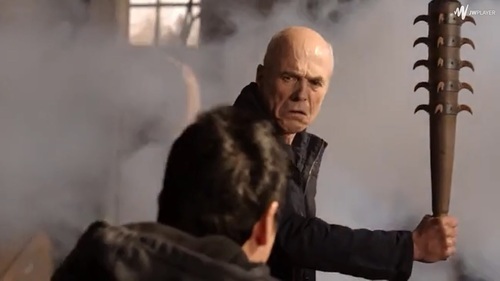 Gerard finally captures Derek, coming out with his plan then threatens Chris and Allison's lives for Derek's bite and cures his terminal cancer. He is then defeated, his plan foiled by Scott and Alan Deaton whom had drugged him with mountain ash beforehand, culminating in him being crippled. In Season 3, Gerard is held at a medical facility, where Chris, Scott and Allison come to him for information. In Season 5, Gerard is healed of his ailment, then recruited by Chris, so to help combat the revived Beast of Gevaudan. He tells the tale of the Beast's origins including that of the Pike. He plans to restore his family legacy as hunters to power by killing the Beast once more, planning to sacrifice or betray anyone involved. Scott and Chris double-cross him after securing the Pike, then Gerard is shot, incapacitated once again. In Season 6, Gerard recruits Tamora Monroe, a burgeoning hunter to help build his army, influenced by the Anuk-Ite's to purge Beacon Hills and the world of all supernatural creatures. Gerard is simply nothing more than a psychopath of the highest order. He is an absolutely ruthless hunter who will murder, hunt or terrorize any supernatural for any reason. He constantly proves to be cold-hearted, stoic and merciless, showing little to no emotion. Gerard never discriminates between his victims whether they were innocent or not, human or otherwise, has no care for any collateral damage and does whatever he pleases. Gerard has a thirst for destruction and terror. He feels no guilt, remorse for any of his actions, any sense of fear, nor any regard for life. He feels only pride and pleasure for the monstrosities he commits as a hunter of the supernatural. He easily betrayed and murdered three of his fellow hunters then framed the alpha Deucalion for their deaths, scoffing at the latter's peace proposal between the hunter families and the packs just to perpetuate further conflict and bloodshed between the two opposing forces. Gerard is firmly of the opinion that all supernatural creatures should be put down and has no limits about how to accomplish this even leaving a trail of bodies in his wake. Gerard is a firm believer in the survival of the fittest. He holds self-preservation above all else, and admits without hesitation he will commit the unthinkable to ensure his own survival. He heartlessly endorsed that his own daughter-in-law Victoria commit suicide simply to obey the hunter's honor code. However, his planning to be bitten himself to cure his cancer at the same time, and using the supernatural for his own ends by becoming a kanima's master, shows his being a massive hypocrite and highlights his cruel and selfish nature. He even threatened the lives of his own son and granddaughter to this end. "You monster. ... You'll kill her too??!!" Gerard is a highly skilled manipulator, actor, liar and very crafty. He will take advantage of, betray or sacrifice anyone he sees fit if doing so will benefit him in some way, either for his own self-worth or to satisfy his thirst for blood. Gerard is just as calculating as he is treacherous, having a reputation for bidding his time and always having a plan. He expertly instigated cold tactical advantages to cure his cancer by holding Allison and Melissa's lives over Scott's head while previously exploiting his family's obligation to hunting the supernatural in their feud against Derek Hale. He is very adapt at having people see things from his viewpoint. His upbringing twisted his daughter, Kate Argent into becoming the sadistic murderer she is. Likewise he molded Allison into becoming a cold and ruthless hunter using well-placed emotional hooks like her mother's death to corrupt her and played on Tamora Monroe's paranoia and vindictiveness against the supernatural resulting in her leading his new army when in truth he is pulling the strings. Gerard Argent is the patriarch of the Argent family, and a feared, bloodthirsty hunter. 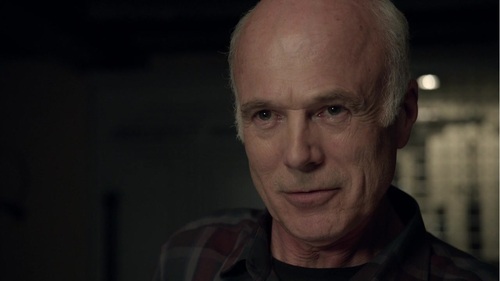 Gerard is Chris and Kate Argent's father, and Allison Argent's grandfather. Gerard had a brother named Alexander Argent who, according to Gerard himself, was Bitten by the Alpha werewolf Deucalion. Alexander committed suicide to follow the Hunter's Code. Gerard raised his children Chris and Kate to be hunters of the supernatural, to believe in the Hunters' crusade, serving his own bloodthirsty nature. His parenting and tutelage twisted and brainwashed Kate, her becoming the sociopath she is, though Chris always had a sense of morals. When Chris was younger, one of Chris' dogs contracted rabies. Gerard shot the dog to put it out of it's misery. He iterated to his son a merciless fallacy: "Anything that dangerous, that out of control, is better off dead". When Chris was 18 years of age, Gerard had him conduct his first gun deal, a simple exchange. Gerard purposefully left out the fact the buyers were Yakuza, Japanese mafiya. He wanted to see if Chris could adapt in the heat of the situation, testing his ability to survive. A decade or so before the series time, Gerard and Chris headed a hunt for a werewolf that had killed two of their own people. This werewolf was eventually hunted, killed and cut in half. 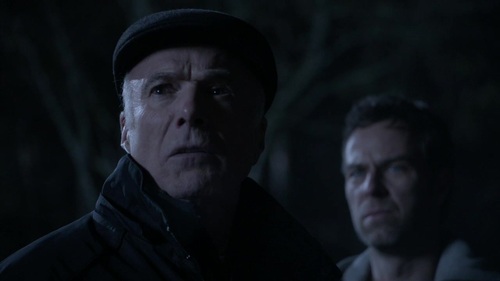 Some time later a message came to the Argents through Alan Deaton who was emissary to the Hale family, a prominent Pack, that the Alpha Deucalion had proposed a peace offering, to bring an end to needless violence killing between the nearby Packs and the Hunters. Three hunters who also wished for peace accompanied Gerard to meet the Pack on equal grounds in an abandoned distillery. The meeting commenced. Unfortunately Gerard had planned in advance for everything to go wrong. Incapacitating both parties with knockout gas after immunizing himself, Gerard then unveiled a spiked mace he'd stored in the distillery. Using the weapon to disguise it as a murder committed by a werewolf, Gerard struck down his fellow hunters right afterward, to Deucalion's horror. Gerard mockingly replied that his comrades wanted peace too, then blamed the alpha for their deaths. The psychopath then moved on to kill Deucalion's three Betas. Lastly, he came upon the weakened and duped alpha. Making fun of Deucalion's peace proposal and taking out two flashbang arrows, Gerard gouged out Deucalion's eyes, leaving the werewolf screaming in agony. Gerard's actions resulted in Deucalion being framed for the faux peace summit and the dark path the Alpha eventually went down, instigating the werewolf-hunter war that persisted to the present. Prior to Season 2, Gerard learned he was dying of cancer. He became dependent on a medication stored in a private container. He decided the way to save himself was to receive the Bite to cure his illness. Learning of Kate's death in Beacon Hills, California and Derek Hale becoming an Alpha, Gerard made his way to the town. Gerard arrives in Beacon Hills to attend the funeral of his daughter, Kate. Arriving at the event which is a media circus, he sees Matt Daehler taking photos. He accosts the boy taking his camera. Gerard: "And how expensive is this?" He takes SD card out of the camera and snaps it in half with his fingers. He hands a disgruntled Matt back the camera and shoos him off. Gerard greets Chris, his son, though Chris only calls him by his first name. Gerard then greets Victoria, and finally Allison. He asks Allison if she remembers him. Allison doesn't. Gerard allows that the last time she saw him was when she was three and then if she'd be willing to call him Grandpa. She isn't, so he settles for Gerard. The funeral commences. Later at night, Gerard, Chris, and their men chase down a lone unnamed werewolf in the Beacon Hills Preserve who'd attacked an ambulance earlier. The stranger gets caught in a trap laid by the hunters next to a river, feral and out of his mind. Chris shocks the man to force him into his human guise. The man admits to have attacked an ambulance, but that the patient was already dead and explains that he came looking for 'the Alpha'. The stranger pleads for his life, swearing he hurt nobody, that he didn't do anything. Gerard realizes and announces to his fellow hunters that the homeless man is an omega, one who has no pack. He drawls that the man could have been casted out of his pack or a survivor of a pack's destruction, or he's by himself by choice. Wickedly, Gerard says the latter option is not a wise choice, as one rarely survives on his own. Gerard then takes a broadsword from another hunter. Gerard: "Because as I am about to demonstrate...an omega rarely survives ... on his own." He intends to declare war upon any creature the Argents come across. He bisects the cowering, defenseless man in half with no mercy. Chris objects, horrified by his father's actions saying they have a code. Gerard talks back saying that from now on they will forsake the code. In truth, he is only presenting himself as thirsty for vengeance for his true agenda. Gerard: "No Code. Not any more. From now on these things are just bodies waiting to be cut in half. Are you listening? Gerard then follows up with a declaration that he cares not if any werewolf they come across are weak, misled or misunderstood. Nor if they are seemingly benign, harmless to the general human population. They find any supernatural creature, they are to kill them and all of them without question. A few days later, the Argents follow through on their new course of action, with Chris and Victoria abducting the school principal, and Victoria tortures him to quit so Gerard can be installed in his place. 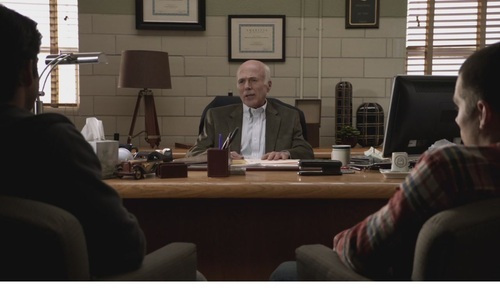 Scott and Stiles find this out when they purposefully get themselves sent to the principal's office to spy on Sheriff Stilinski interviewing Jackson Whittemore about Isaac Lahey. They both see Gerard is now acting as the principal. He looks up both their records. Gerard decides to tell the both of them that only one of them will have to remain for detention. Stiles gets detention while Scott is let go. That night Gerard and Chris discuss Isaac Lahey being incarcerated. They are aware of Mr. Lahey's death, convinced there's supernatural elements at work. He wants Isaac dead. Chris wants more proof that Isaac is a werewolf. They catch Allison watching them and close the door to continue talking. They decide to send a hunter into the station disguised as an officer to inject Isaac with wolfsbane. Their plan fails. After one of their hunters is killed by the kanima, Chris brings the body to Dr. Deaton to get his opinion. Gerard accompanies him to hear the results. The elderly hunter greets Deaton, last he heard the latter had retired. Deaton tells them all that they should be very afraid of whatever creature did this because it's nothing he's ever seen before. Later that night, Gerard surprises Allison when she goes to check if Scott has left her any messages on her car window. She acts cagey, so he asks her if she was expecting someone else. She says yes, then no, and looks nervous. Gerard drops his leather-bound book, which Allison picks up for him, and then takes a handful of medication. He asks Allison if he can trust her, and when she doesn't answer forcefully, scares her into answering with full voice. The next day, Allison and Gerard go to watch a lacrosse game. She noticed him putting his keys in his coat pocket, and during the game pretends to be cold so he'll loan her his coat. When he does, Allison takes the keys and slips them to Stiles so he can go to Gerard's office and look for the bestiary, which they think is a leather-bound book. Scott is unable to use his werewolf powers on the field because he's afraid of Gerard seeing, although when Scott breaks his leg and is immediately better, Gerard figures out that he's a werewolf. He asks Scott to come back to their place for dinner. Dinner at the Argents is incredibly awkward. Gerard pokes everyone about their behavior, because kids should be able to break up and still be friends. Eventually Allison and Scott leave the table to "look over some English notes". Scott eventually leaves claiming that he has to pick up his mom from work. Once Scott shows up at the hospital, Gerard is waiting for him, then. He stabs Scott in the gut with a knife, revealing he knows Scott is a beta. "That's right. I can play the nice, doddering grandpa who likes to cook and tell stories and be sweet and charming. And trust me, I can play it far better than you can at playing average broken-hearted teenage boy. Gerard threatens Scott that he's going to do what he says or he will kill Melissa. Scott agrees to do what he says, and Gerard walks away, tipping his hat to a passing lady as though he's a kindly old gentleman. Gerard and Chris focus tracking down the kanima and end up following it while Derek Hale, Scott, and Stiles follow it from Scott's house. Chris empties a clip into it, but it just gets back up. The kanima then goes to Gerard, but Gerard isn't afraid. The shapeshifter just stays motionless and they stare at one another. The kanima only leaves because Scott tackles it. Scott gives the psychopathic hunter a contemptuous look and then turns to follow the kanima. Chris sees his father have this strange interaction with the kanima and asks him about it later. They wait outside the club Jungle. It manages to paralyze a few people, including Danny. Chris listens to the police talk about the attack afterward and reports to Gerard that they're calling it a drug overdose. He then asks why Gerard wasn't afraid of the kanima when it came at him. Gerard explains that the kanima has rules so he knew it wouldn't attack him. Chris wonders if they should focus on the kanima instead of Derek, but Gerard disagrees. The other shapeshifter has caught Derek's attention, so they should use it as an opportunity. He asks his son what did he teach him the best way to eliminate a threat was. Chris answers: "Get someone else to do it for you". The next day at school Gerard questions Allison about her whereabouts during last night. She answers she was studying with Lydia. Gerard questions her on what she knows of Sun Tzu’s The Art of War. She answers that to defeat an enemy, you must know everything about it. Gerard commends her, but informs her that the hunters are trying to know th kanima but they know "next to nothing". Gerard questions her if she knew Jackson Whittemore was missing. Allison is nervous, and he can tell that she's lying. He gets up and stands behind her so he can feel her pulse to tell if she's lying. He asks her if she knows anything about Jackson. She says no. He asks if Jackson is in trouble. She replies that she doesn't know. He asks if it has anything to do with Scott, and Allison says no. Gerard tells her that her pulse jumped. She gets up out of her chair and accuses him of scaring her. He fakes an apology and lets her leave. Allison eventually tells Chris about the kanima, and they decide to try to take it down at the rave. Chris tells his hunters that he doesn't want any collateral damage during this mission. Allison is supposed to let them all know when she has Jackson away from the crowd. When he sends her on her way, Gerard points out that Allison doesn't seem to know that this is a mission to kill not capture. Gerard accompanies the hunters to the rave but doesn't do much personally. He observes the mountain ash line that Stiles laid around the building but doesn't break it. Victoria gets Bitten by Derek during a fight, and the Argents rush home. Chris tries to clean the wound and convince everyone that they don't actually know if the bite was enough to turn her. Gerard says that she's been Bitten, that it's his role to play tough patriarch holding their family to its commitments. He lectures Chris the next full moon is around the bend. Chris protests for Allison's sake, that she can't lose her mother. Gerard heartlessly endorses that Victoria is already dead. She's just a cocoon now waiting to hatch. On the night of the full moon, Victoria gets ready to commit suicide, Gerard tells his son not to hesitate because of Allison, that she'll be shaken time and again in her life. He once again forces his son to adhere to the Code and help Victoria kill herself with dignity. Gerard enters Allison's room, where Allison is grieving her mother. He gently tells her he understands she is mourning, but his comforting of her is all a facade. He manipulates Allison's grief of Victoria's death to help further his agenda. He has a letter that Victoria wrote to her and tells her that if he got a letter like that, he wouldn't rest until his mother's killer was avenged. Gerard then urges Allison to burn it once she has read it. His emotional manipulation results in Allison becoming reminiscent of Kate ruthless and cold-hearted. Allison gets a text from Matt on Scott's phone asking her for the bestiary, and that's how they learn that the kanima and Derek are the sheriff's station. Gerard tells Allison that she needs to decide what they should do from a place of strategy instead of emotion, even though he's done everything he can to make sure she's acting emotionally. Allison decides that Derek is their top priority. The Argents all go in, shooting up the station and tossing in some smoke bombs. Gerard runs into Scott in the hallway, and Scott complains that this isn't how it was supposed to happen. Scott was to become a mole in Derek's Pack, give Gerard all the information he knew all along, Jackson being the Kanima, Matt being his Master. Gerard tells Scott that he will handle Matt and the kanima, telling the Beta to deal with his friends and his mother. He accidentally drops his pill box, and Scott hands it back to him. Matt escapes from the station but runs into Gerard outside. Gerard drowns the teenager in the river. Gerard walks out of the river. He sees the Kanima. It is cowering like little kitten. Gerard speaks to the beast, that it no longer has a fear of the water. The shapeshifter perks up at Gerard, intrigued and begins coming toward him. Gerard touches his palm against that of the Kanima, taking control of the shapeshifter for himself. Gerard breaks into Scott's house, sitting in his chair. Scott comes out of the shower to find Gerard in his room and the kanima holding Melissa hostage. He laughs at Scott flicking out his claws. Gerard says they have a lot to talk about. He confronts Scott he hasn't been answering his messages. He warns Scott not to play any games as he now has a very impressive means (being Master of the Kanima) with which to persuade people. Gerard wants Scott to deliver Derek and his Pack to him. He attends the next night's lacrosse game and tells Scott that when the clock reaches 30 seconds, Jackson is going to start killing people if Scott doesn't give Derek up. He presses Scott's buttons over the werewolf's hearing, threatening his mom's life again, or Sheriff Stilinski, Lydia, or Coach. Scott spends the entire game trying to figure out what to do. Eventually, Isaac shows up and starts taking out his own players so that Scott can get on the field. Gerard has Jackson poison Isaac, telling Scott that if he's going to play chess, he has to be prepared to lose a few pawns. 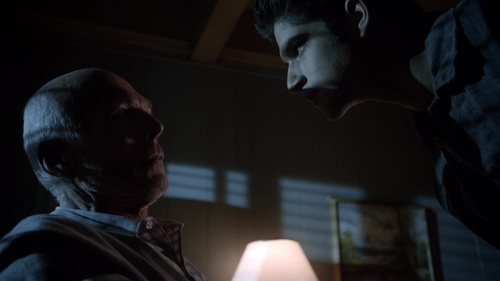 Scott loses sight of the malicious old man, but he can still hear him speak, saying he'll trade Allison for Derek and his Pack. Isaac is taken off the field, and into the boys locker room. Gerard and his hunters track him down in the boys locker room. Gerard has a sword and is going to cut Isaac in half, but Scott shows up to intervene. Scott incapitates the two other man, but Gerard slips away. Instead, Gerard has Jackson stab himself and kidnaps Stiles. Stiles gets thrown in the basement, and Gerard beats him up as a warning to Scott. He's released a few hours later and returns home. Gerard is sure everything is now coming to a head. He tells Allison to get some sleep because the next day is going to be very interesting. Chris confronts him over Jackson's apparent death. Gerard returns that they've won. Chris has dad it with Gerard's genocidal ways. Gerard later senses Jackson starting to Evolve, transform through his bond to his servant. He alerts Allison that "it's" starting. Scott, Chris (having switched sides) and Isaac deliver Jacksons' body to Derek and Peter in a warehouse. Chris is affronted that Gerard is now Jackson's Master, saying his father wouldn't let a rabid dog live. 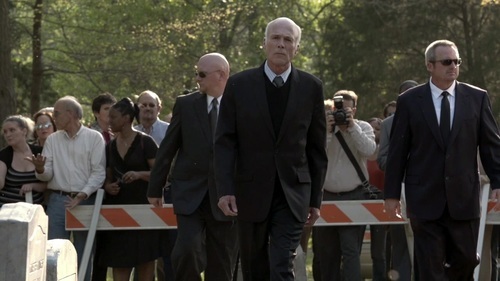 Gerard appears at that moment, having tracked Jackson's body. He confirms he wouldn't. Gerard commends Scott for bringing Jackson in order to save him, having anticipated he would "like the concerned friend (he is)". Allison moves in, ambushing the Wolves in her fury and under Gerard's sway. Unbeknownst to her, Gerard has Jackson wake up and the kanima faces off against the three werewolves. Gerard now has the kanima and Derek in the same place without having to do the work himself. The kanima eventually paralyzes Derek in the skirmish. Allison makes her move to kill Derek calculating this is what Gerard planned. She's wrong. Gerard has the shapeshifter grab her by the throat. Allison is frightened and confused, as is everyone. Gerard comes out with his plan now that he has Derek in his grasp. Scott says Gerard is doing what he came here to do. Gerard reveals that he has cancer. He intends to be Bitten by Derek to cure himself, betraying and manipulating everyone all along for his own gain. Allison gasps in horror, realizing her grandfather has been manipulating her, and pulled her under his sway; Gerard then has the Kanima pull Allison's thraot into a deathly grip, intending to force Scott's hand to have Derek Bite him. Chris is incensed at his father's betrayal and lies. He brands Gerard a monster, threatening his daughter's life. Gerard declares without remorse, nor hesitation, not only would he kill Allison, he'd kill Chris if it meant surviving. 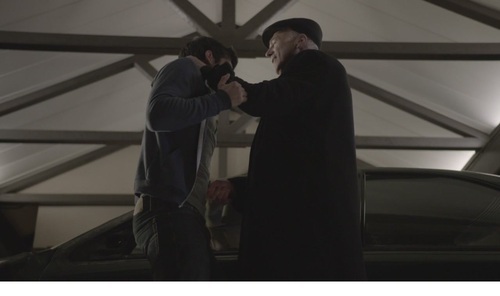 Derek tells Scott no, but Gerard rups in Derek's face that Scott will do it because Allison will live. Scott complies hauling Derek up and forces his mouth open so Gerard can impale his arm on the Alpha's fangs. Gerard then holds up his Bitten arm in triumph. Suddenly as everyone watches, the wound starts to bleed black ooze. Gerard sees this new development. Scott announces he had a plan as well. Gerard realizes he's been tricked. He further remembers Scott handing him his cancer medication container during the skirmish at the Sheriff's station. Scott had switched his medication with capsules filled with mountain ash. 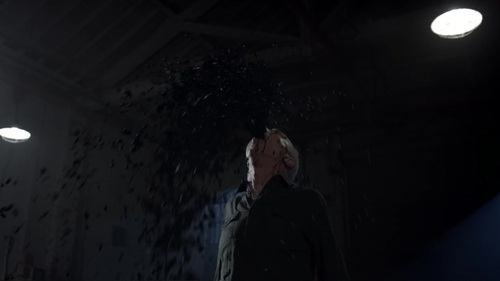 Because of the supernatural ward in his system, Gerard's body rejects the Bite, black ooze ejecting out his eyes, nose, ears, and vomis up a fountain load of the substance black ooze and collapses, incapacitated. Gerard manages to order the Kanima to kill everyone. Before the shapeshifter carries out this order, Gerard loses consciousness, his bond with Jackson severing as the creature releases Allison. Stiles and Lydia show up to save Jackson, and while they are, Gerard crawls away. He leaves a trail of black ooze behind him. Gerard is revealed to be alive. He is still suffering from the effect of the rejected Bite. His cancer is now vanished, but his body is continuously producing and ejecting black ooze. He is institutionalized at a medical facility and confined to a wheelchair. Gerard is visited by Chris for information. Chris brings up his uncle Alexander Argent, Gerard's brother. Alexander had committed suicide to follow the hunter's Code. He asks Gerard for the name of the Alpha who Bit him. Gerard smirks, answering "Deucalion". Days later, Chris comes to him again for intel on the Alphas' leader, but this time Gerard is not so willing. Chris leaves but he tells his despicable father, he is going to tell him their family's story of Deucalion, and he is going to tell him the truth. Shortly after Chris' departure, Gerard's next visitor is Allison who'd followed Chris. Allison brings Scott to Gerard for information on Deucalion. Scott has to siphon pain from Gerard as his end of the deal. Gerard ascertains the Darach could be committing human sacrifices to destroy the Alpha Pack, saying the lengths one would go to defeat someone like Deucalion would certainly surprise someone. He's paints himself as the victim in the story, when he's really the villain. Gerard tells them the story of what happened ten years or so earlier. 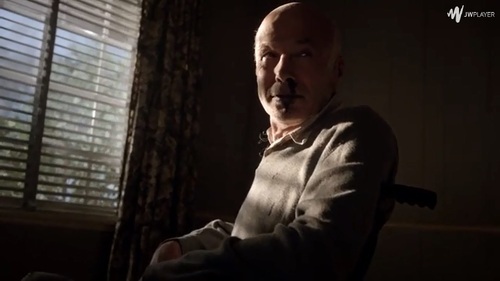 He recalls when Dr. Deaton came to announce a meeting between Deucalion and his Pack. The Alpha was offering a peace proposal meeting in an abandoned distillery. Gerard references William Blake: any sinister person intending to be your enemy always starts off with being your friend, and the fable of the Scorpion and the Turtle. Gerard recalls he knows a werewol's nature. He recounts the peace offering was an ambush, lies that Deucalion's Pack members killed the hunters that accompanied Gerard. Gerard eventually blinded Deucalion by gouging out his eyes. However, Gerard later says while Deucalion lost his eyes, he's not always blind. He's able to see as a Wolf. Gerard plays amicable saying he thinks about Scott, how he'd got the Bite to cure his cancer, wondering "when it became my nature to believe most things couldn't be asked for but had to be taken. Scott talks back at the old man saying he doesn't believe him. He listened to his heartbeat all the while he was telling his "story" and it was steady. Gerard claims he was telling the truth. Scott counters it could be because Gerard's just that good a liar. The werewolf grips Gerard's arm painfully and gets in his face. He threatens the heartless man if he lied, and innocents get hurt because of it, Scott tells Gerard he'll be back "to take away more than (his) pain."